This is a fantastic choice for that difficult location in your landscaping or garden. 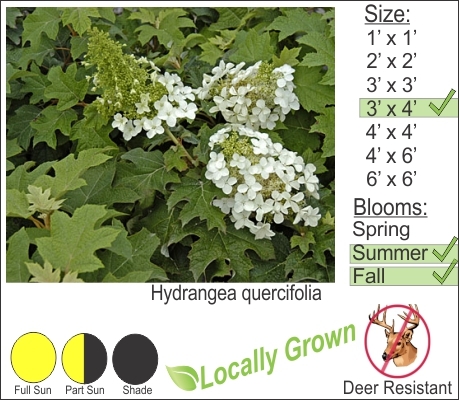 Oak leaf Hydrangea is a deer resistant shrub that can handle full sun to shade. The leaves of this hydrangea resemble that of an oak tree providing a unique texture in your landscape. Oak Leaf Hydrangea flowers in the summer and then for Autumn the leaves turn oranges, reds and maroons for a fantastic fall display. You won’t go wrong planting this shrub.